Grisele Gamboa is a medical assistant at The Pediatric Group on Mt. Lucas Road in Princeton. After a series of jobs first in her hometown of Brooklyn, then getting married and moving to New Jersey and working as a paraoptometric assistant for Dr. Charles Allen in Princeton and a brief stint in the corporate world, she decided that nursing would be her future. Starting at The Pediatric Group about four years ago was a big step in that direction. Grisele, age 29, lives in Bridgewater with her husband and two-year-old son and is expecting another child in early May. She hopes to stay with The Pediatric Group forever and plans to earn her RN and possibly nurse practitioner degrees as she juggles her family and career over the next few years. 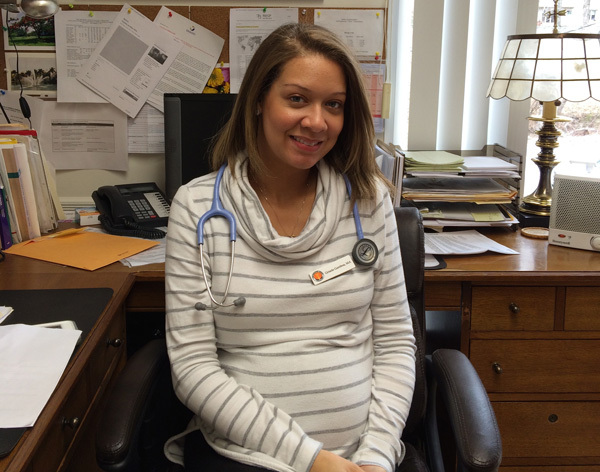 Here, in her own words, Grisele talks about her life in the pediatrician’s office. Weeks into the job here I fell in love with it. I knew this was what I wanted to do. It’s a great place. I love seeing all the patients. Seeing all the little babies grow up is amazing. I knew this was what I wanted to be doing, so I went to school and graduated with a certificate as medical assistant. And once I did that they gave me more responsibilities here. I was able to administer vaccines, draw blood and be more hands-on with the patients. I also still do the front desk, answering the phone and making appointments, so I have a lot of face-time with the patients in the front and the back. Being here I can’t imagine going anywhere else. Once I started working here with the kids, I knew. It just felt right. Being here made me solidify that dream of going back to school and becoming a full-time registered nurse. I’m not from the best neighborhood in Brooklyn. My parents were hard working, working class. They instilled in me a very strong work ethic—that no matter what you‘re doing you be the best at it. I come in early and I stay as long as I have to. I might complain about it, but I’ll do it and I’ll do it right. That’s always been my way. Furthering my education is something I never saw happening, because of where I grew up. I dropped out of high school really young, but once I got into working I realized that I needed to further my education. I went back to school and got my G.E.D. School has not always been my friend, so for me to say I want to further my education is a big step. Graduating to be a medical assistant is a big accomplishment for me. I never thought it would happen at all. Now I’m prepared for college. It means more now because it’s really something I want to do. I’m prepared for it. I’m happy I did it this way rather than go right into college. I start my days at 5 a.m. because my husband needs to be out of the house by 6, and he drops off our son at his mother’s house. I get them out the door by 6 and then I get ready. I get here between 8 and 9, and we open the nurse station to prepare for the day. We restock everything. I like to look at the schedule and see what kind of day I’m in for, but honestly you never know what’s going to walk in through that door. There are times when there are eight people on the schedule for the day, and when you walk in there are suddenly 24. And sometimes you think you’re going to have an easy day, but there’ll be the one patient that’s sick and needs blood treatments, and you have to call the hospital. But I live for those days. I look forward to days when there’s a problem-solving kind of issue because that’s how you learn. Those are the people that I have more of a relationship with because I’m part of making the kid feel better. And that must mean the world to them because I can do that. A kid comes in throwing up and feeling horrible and he leaves happy with a sticker. Those are the days I live for. It’s amazing when you can make someone feel better. I do two jobs: at the nurses’ station and at the front desk. On Tuesdays, working as a nurse, I do all the vital signs with patients, and I get as much information as possible before they see the doctor. After they see the doctor they are sent back to the nurses’ station with an order, like they need blood work or a strep test or vaccines, and we fill the order, so there’s a constant flow in and out. I might see 30-40 kids in a day. Sometimes when three o’clock hits it’s as if the school bus let them all off at our door. Sometimes six or seven people will come in at a time, so we try to prepare for that too. Your job starts when the patient walks in, and you have to try and read them. Is he going to be a fighter, or is he going to be brave or am I going to have to talk him into this? You have to read the patient and go from there,. because some are not a problem, but some—you have to coax them through it. There are some two-year-olds who don’t cry, and there are some 19-year-olds who come in screaming. Sometimes there are patients where you have to scream for another nurse to help you hold them down to get anything done, but we don’t have that often. I had a patient who had special needs. He was a lot bigger than me and my nervousness came from not knowing what to expect. He was nervous from the beginning because I had to administer a vaccine, and I was nervous that he was going to flip out and scream because he was already screaming when he walked in the door. But I was able to talk him through it, even though he never made eye contact with me. I was able to calm him down, talk to him, and say, “You’re going to be ok. It’s just a small pinch. I promise I’ll be quick and when we’re done you can have a lollipop or sticker. You’re going to be nice and brave.” I was able to administer the vaccine and he stopped screaming and it was fine, and I was so proud of myself that I was able to handle it on my own. When you have a patient come in for something like a rash you might think “just a rash.” In our field we know what’s severe and what’s not, but to them it’s severe. So you have to be compassionate to try and make them feel comfortable and important. And patience is important, because you’re dealing with children. If you don’t have patience you’re not going to get anything done. There are times when we have to talk patients into getting something done. It’s a lot of negotiation, sometimes 30 minutes or more. Patience is 100 percent—it’s just what you have to do. It’s important to come to the doctor, to stay up to date. People don’t understand that it’s important to establish a relationship with your doctor. One of the important relationships to have in your life is with your doctor. There are people here who have seen their doctors since they were little children and now they’re 40 and bringing their kids here. Take advantage of all the things your doctor offers. We have the doctor call-in hour from 8 to 9 in the morning, when you can call in and speak to the doctor directly. A lot of people don’t do that. Ask questions. There are no stupid questions. If it puts your mind at ease it’s worth it. I feel like this is a very rewarding field. We see them from the day after they’re discharged from the hospital. Seeing them grow up is amazing. And it’s rewarding when you see a really sick child and you do all you can, and then a week later they come back and they’re doing so much better. We feel so happy. My heart is full working here. I can’t see myself working anywhere else.